It’s been so long since I’ve shared a recipe here that I’ve forgotten how to start writing these posts. Do I start with a “Dear Friends,” or jump right into talking about this insanely delicious horchata smoothie? I suppose I should start with the big news first- we have a baby! My husband, Pasha, and I welcomed our daughter into the world last week. We are blissful, exhausted, and ready to begin the journey of parenthood. This creamy horchata smoothie is literally the most delicious smoothie I have ever had, period. Dates and cinnamon work their magic in this simple, vitamin packed treat. Another bonus of this horchata smoothie? It’s perfect for pregnancies! There’s an old wives tale, claiming that eating 6 dates per day in the last month of pregnancy can improve labor, that was confirmed in this initial study. Eating 6 dates every single day for an entire month can be a chore even if you like dates. I love dates and I had a hard time eating them after the first few days. Blending them into deliciously creamy horchata smoothies definitely helped. Aside from the pregnancy perks of this horchata smoothie, it’s just so damn good. It’s the perfect easy way to satisfy your sweet tooth in a healthy way. To save this recipe for later, pin the photo below! 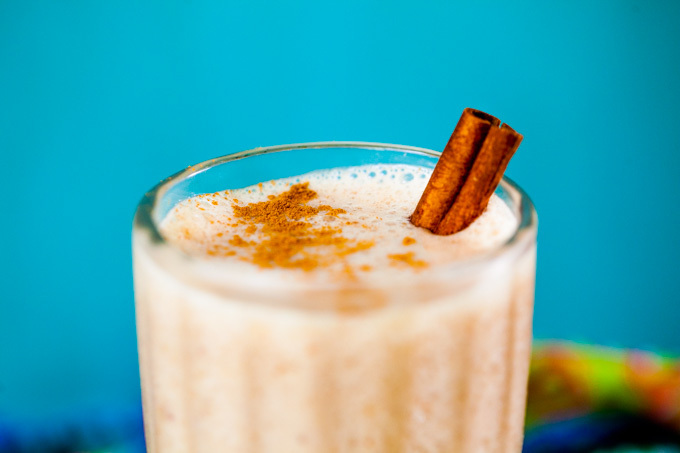 Creamy, naturally sweetened, cinnamon spiced Horchata smoothie. Packed with vitamin-rich dates and so much flavor! Make this even healthier by adding ½ cup frozen spinach and/or 2 Tbsp chia seeds. Follow us on Instagram and Pinterest for more!